We’re living in something of a golden age of superhero movies and audiences have come to expect certain things from the genre. Usually, some world-ending apocalypse, spread across a shared universe and prevented at the last minute by a group of powerful yet jokey individuals. Sound familiar? The formula for a successful superhero movie has been set largely by the astronomical success of the MCU (although Fox’s R-rated mutants and the DC Extended Universe’s grimdark heroes have their role to play), but one thing all superhero films can agree on is that the genre isn’t just for kids anymore. 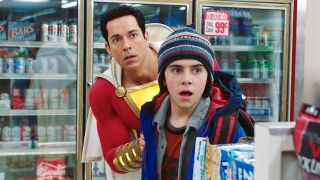 Enter Shazam!, the first superhero film to adopt the stick that high-brow critics and viewers use to beat the genre with: it is actually and unashamedly a kids’ film. Shazam! hits every beat of the classic family adventure genre (even squeezing in a direct Big reference), is packed full of thrills and earnest humour, has a scenery-munching villain with zero redeeming qualities, and, most importantly, a huge dose of the wish-fulfillment wonder that superheroes are all about. Note: There's some story spoiler for Shazam! from this point onwards so make sure you've seen the film before you continue. Superheroes may come from a background of primary colours and kid-friendly good vs evil battles, but, let’s be honest, superhero films have been aimed at adults since Tim Burton’s Batman, and they’ve been typecast in a very particular way since the irreverent, brash stylings of Jon Favreau’s Iron Man. That film sets the perfect grounded tone for Tony Stark, but has since been employed by the vast majority of MCU films, as well as many others. In their eagerness to reinvent superheroes as acceptable adult fare, the films have thrown out the baby with the bathwater. They’re extraordinarily good at spectacle, but where’s the wonder? Perhaps now, as an adult, your favourite superhero film is the Oscar-winning, near-perfect The Dark Knight, but that film is almost certainly not why you love Batman. There will have been a moment in childhood where you encountered the Bat for the first time, in comics, maybe, or in animation. You saw him swinging from rooftops with his cape swirling around him and thought: I want to be him. I COULD be him. That’s what Shazam! captures with every moment of its running time: that wish-fulfillment that is inherent - albeit often forgotten - in the superhero genre. It veered wildly away from the prevalent dark tone of DC movies and embraced the purity of the superhero concept in a way that we haven’t seen since Richard Donner’s Superman. It wears its heart on its sleeve. It’s not embarrassed to tell a story about learning to accept love and support in order to reach your potential. In this era of superhero films, that sort of straight-faced sincerity makes it a game-changer. The film out-and-out rejects the notion of ‘dark superheroes’ in a scene where Billy Batson, AKA Shazam, pretends to be seduced by the pull of dark power, before laughing it off as ‘weird’. That moment sums up the entire film’s approach - being a superhero isn’t a chore, it’s fun. The humour of superhero films is usually typified by a self-referential cocked-eyebrow at the excesses of the genre, but with Shazam! you’re simply having fun with the characters. You feel every bit of Billy’s giddy excitement as he urges gunmen to shoot him again when he realises he’s bulletproof. The wish-fulfillment theme is taken to a whole other level in a triumphant finale that we’re loathe to spoil, but which drums home the core message of being a superhero - it’s not about angst, or violence, or fuelling your own ego, it’s about standing up for what’s right, and anyone can do that. It’s no surprise that the current superhero movie trend is for darkness, or at least for cynicism. Hope and sincerity are just not cool at the moment. MCU movies have their moments of sincerity, but undercut them with a knowing gag just before the audience starts to get fidgety. For example, Groot’s sort-of death in the original Guardians of the Galaxy is a genuinely emotional moment, but less than five minutes later we find ourselves in a dance-off. But Shazam! stays with its characters through the hard moments - we see Billy struggling with his initial cowardly response to the villainous Sivana, we see Freddy navigating his own frustrations with Billy, who is squandering everything the disabled Freddy knows he can’t have. And Billy’s eventual meeting with his long-lost mother is painful, honest, and more grown up than anything the MCU has tackled. It makes Tony and Steve’s Civil War conflict look frankly immature. Shazam! isn’t afraid to get emotional, because children aren’t afraid of emotion - that’s something we learn in adulthood. Shazam! also benefits from having a lower budget than other superhero movies, which allowed director David F Sandberg to keep things tightly focused on Billy, Sivana, and Billy's foster family. At a time when superhero stakes have become so sky-high that Marvel has literally wiped out half of their universe, Shazam!’s a breath of fresh air. The stakes here are (relatively) small and personal: Billy simply wants to protect the family he’s only just found. It proves that the fate of the world doesn’t have to be on the line for audiences to care. I love superhero films. I’ll be bawling my way through Avengers: Endgame like everyone else. But Shazam! reignited something in me that I didn’t know had been extinguished. For the first time in a long time, I left the cinema grinning from ear to ear and desperately wanting to be a superhero. So let’s put aside the high stakes and the darkness and the heroes who casually murder people for a while, and let superhero movies be for kids again, because we’re all big kids at heart anyway. If you can't get enough of DCEU's newest hero, here's a breakdown of the Shazam! post-credits scenes for you to delve into.